Toshiba's L855-149 is the next notebook to be reviewed, released as part of their ever expanding Satellite range; a 15.6" display laptop, complete with a fairly competitive feature list. Inside you'll find the Intel Core i7 - 3630QM processor, 6GB of DDR3 RAM, a 750GB hard drive complete with a copy of Windows 8 loaded. Finished in a smart ice blue colour scheme, this laptop certainly looks smart. Read on for our Toshiba Satellite L855-149 Review. 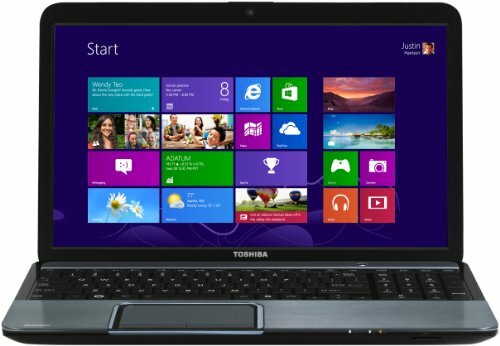 Below is our review of the Toshiba Satellite L855-149, a 15.6" laptop, featuring 6GB RAM, 750GB hard drive and Windows 8. Next up is the L855-149, situated somewhere between high end £1000 notebooks, and mid range £400 laptops, offering a decent specification for a price tag of around £630. Finished in what Toshiba describe as "Ice Blue Brushed Aluminium" casing, it has the look and feel of an expensive laptop. the interior of the notebook has a similar colour scheme, with the keyboard and touchpad surround in the ice blue finish, and the keyboard itself coloured black. The use of brushed aluminium gives it a feel of class, thus setting it apart from the average plastic laptop - if aesthetics are a large part of the criteria of choosing a notebook, then you may well like to give this notebook a closer look. Enough about the appearance, and onto the specification. Inside you'll find the Intel Core i7 - 3630QM 2.4GHz processor. This is a quad-core processor used primarily in laptops, which due to hyperthreading supports up to eight parallel threads which provides better usage of the CPU. Supporting this is 6GB of RAM fitted, which helps keep applications running at a fast rate. The 15.6" display provided a decent picture - sharp graphics, decent viewing angle and vibrant colours. In terms of dimensions, this notebook measures 38.0cm by 24.2cm by 32.5cm, and weighs just 2.3kg, which is fairly light considering the specification, and will make this notebook ideal for those who require access to their files, internet and e-mail whilst out and about. Toshiba have added several options for those who require connectivity - VGA, RJ45 (Ethernet), microphone, headphones, a multi card reader supporting the majority of card formats, 1 x USB 2.0, 2 x USB 3.0, HDMI, an integrated HD webcam as well as a DVD drive. The keyboard is of a good size, with the keys evenly spaced, thus helping to eliminate typing errors. To the right hand side is the handy addition of a number pad. The touch pad performed well, and offered an easy and accurate method of controlling the notebook - no issues here. Storage is provided in the form of a 750GB hard drive, which should be ample room for the majority of users, on which the latest copy of Windows 8 is installed. So overall what did we think of the L855-149? Looks great, performs well, and fairly light. If you're looking to puchase a laptop in the £600 price range, and are after one that's powerful enough to be practical, yet still light enough to be portable, then the Toshiba Satellite L855-149 is worth a second look.